The new KRN1000 series paperless process recorders from Autonics feature 5,6” TFT colour LCD touchscreen displays with excellent visibility and intuitive control interfaces. The recorders are capable of processing 27 different inputs including RTD, thermocouple, and analog input types. The outstanding performance of the recorders is matched with affordable prices to ensure top value to users. The recorders also feature high-speed sampling rates of up to 25 ms and an adjustable recording cycle time from 1 to 3600 s. USB, RS-422/485, and Ethernet communication support is standard on all models for flexible application in diverse industrial settings. The units also provide high capacity internal memory storage of 200 MB, and supports external SD/USB memory storage of up to 32 GB, ensuring that no information gets lost. Nine different measurement graph types are available including bar graph, trend graphs, and digital displays, so that users can read important data best matching their application. The KRN1000 series also feature a compact, space-saving design, allowing easy installation in tight or limited spaces. Various user-friendly functions and features are also standard, including easy access pop-up menu, virtual keyboard, 23-colour support, check data history and file history, group settings, event list, and much more. Monitoring and configuration is possible via PC using the free comprehensive device management software DAQMaster. The KRN1000 series is available in 4, 8, 12, and 16 input channel models with various input/output options including digital input, alarm relay output, and 24 VDC power output for transmitters. 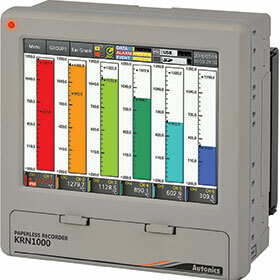 KRN1000 series paperless process recorders.